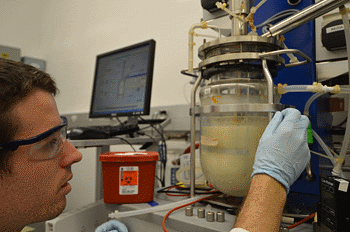 Graduate student Zachary Baer works with a fermentation chamber in the Energy Biosciences Building to separate acetone and butanol (clear top layer) from the yellowish Clostridium brew at the bottom. The chemicals can be extracted and catalytically altered to make a fuel that burns like diesel. BERKELEY — A long-abandoned fermentation process once used to turn starch into explosives can be used to produce renewable diesel fuel to replace the fossil fuels now used in transportation, UC Berkeley scientists have discovered. 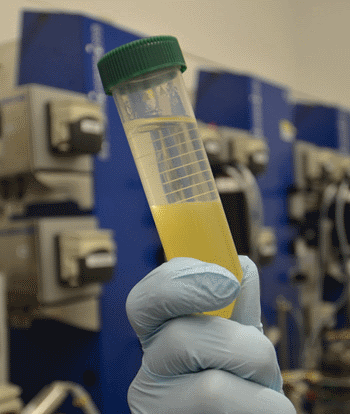 Campus chemists and chemical engineers teamed up to produce diesel fuel from the products of a bacterial fermentation discovered nearly 100 years ago by the first president of Israel, chemist Chaim Weizmann. The retooled process produces a mix of products that contain more energy per gallon than ethanol that is used today in transportation fuels and could be commercialized within 5-10 years. While the fuel’s cost is still higher than diesel or gasoline made from fossil fuels, the scientists said the process would drastically reduce greenhouse gas emissions from transportation, one of the major contributors to global climate change. “What I am really excited about is that this is a fundamentally different way of taking feedstocks – sugar or starch – and making all sorts of renewable things, from fuels to commodity chemicals like plastics,” said Dean Toste, professor of chemistry and co-author of a report on the new development that will appear in the Nov. 8 issue of the journal Nature. The work by Toste, coauthors Harvey Blanch and Douglas Clark, professors of chemical and biomolecular engineering, and their colleagues was supported by the Energy Biosciences Institute, a collaboration between UC Berkeley, Lawrence Berkeley National Laboratory and the University of Illinois at Urbana Champaign, and funded by the energy firm BP. The linkage between Toste, whose EBI work is in the development of novel catalysts, and Clark and Blanch, who are working on cellulose hydrolysis and fermentation, was first suggested by BP chemical engineer Paul Willems, EBI associate director. The collaboration, Willems said, illustrates the potential value that can come from academic-industry partnerships like the EBI. The late Weizmann’s process employs the bacterium Clostridium acetobutylicum to ferment sugars into acetone, butanol and ethanol. Blanch and Clark developed a way of extracting the acetone and butanol from the fermentation mixture while leaving most of the ethanol behind, while Toste developed a catalyst that converted this ideally-proportioned brew into a mix of long-chain hydrocarbons that resembles the combination of hydrocarbons in diesel fuel. Tests showed that it burned about as well as normal petroleum-based diesel fuel. “It looks very compatible with diesel, and can be blended like diesel to suit summer or winter driving conditions in different states,” said Blanch. The process is versatile enough to use a broad range of renewable starting materials, from corn sugar (glucose) and cane sugar (sucrose) to starch, and would work with non-food feedstocks such as grass, trees or field waste in cellulosic processes. “You can tune the size of your hydrocarbons based on the reaction conditions to produce the lighter hydrocarbons typical of gasoline, or the longer-chain hydrocarbons in diesel, or the branched chain hydrocarbons in jet fuel,” Toste said. The fermentation process, dubbed ABE for the three chemicals produced, was discovered by Weizmann around the start of World War I in 1914, and allowed Britain to produce acetone, which was needed to manufacture cordite, used at that time as a military propellant to replace gunpowder. The increased availability and decreased cost of petroleum soon made the process economically uncompetitive, though it was used again as a starting material for synthetic rubber during World War II. The last U.S. factory using the process to produce acetone and butanol closed in 1965. Nevertheless, Blanch said, the process by which the Clostridium bacteria convert sugar or starch to these three chemicals is very efficient. This led him and his laboratory to investigate ways of separating the fermentation products that would use less energy than the common method of distillation. They discovered that several organic solvents, in particular glyceryl tributyrate (tributyrin), could extract the acetone and butanol from the fermentation broth while not extracting much ethanol. Tributyrin is not toxic to the bacterium and, like oil and water, doesn’t mix with the broth. Brought together by the EBI, Blanch and Clark found that Toste had discovered a catalytic process that preferred exactly that proportion of acetone, butanol and ethanol to produce a range of hydrocarbons, primarily ketones, which burn similarly to the alkanes found in diesel. The clear liquid at the top of the vial is glyceryl tributyrate, which extracts the acetone and butanol from the fermentation chamber. This allows chemists to more easily separate the chemicals from the yellow fermenting brew and protects the bacteria, which are killed by high concentrations of the chemicals. The current catalytic process uses palladium and potassium phosphate, but further research is turning up other catalysts that are as effective, but cheaper and longer-lasting, Toste said. The catalysts work by binding ethanol and butanol and converting them to aldehydes, which react with acetone to add more carbon atoms, producing longer hydrocarbons. Clark noted that diesel produced via this process could initially supply niche markets, such as the military, but that renewable fuel standards in states such as California will eventually make biologically produced diesel financially viable, especially for trucks, trains and other vehicles that need more power than battery alternatives can provide. Coauthors of the study include former post-doctoral fellow Pazhamalai Anbarasan, graduate student Zachary C. Baer, postdocs Sanil Sreekumar and Elad Gross and BP chemist Joseph B. Binder.